For a period the title ‘chaplain’ was used by both the rector of Holy Trinity Dorchester (in which parish the hospital was situated) and by his curate who resided in the hospital. Rather unhelpfully, the hospital’s management committee minutes often referred to the chaplain by his title, rather than by his name, making it difficult to identify individuals. Initially, the Rev. George Wood, the then rector of Holy Trinity, acted as honorary chaplain because the staff and patients in the hospital were his parishioners. Then, in 1842, a Chaplaincy Fund was set up so that a stipend could be paid. The Bishop of Salisbury specially licensed the rector to be chaplain, and he appointed a curate to reside in the hospital, his stipend being paid from the fund. It was during this period that the resident curates were sometimes referred to as the ‘chaplain’ even though, strictly speaking, that title belonged to the rector. In 1855 this arrangement ceased, and the hospital appointed its own chaplain, independent of the rector. In 1887 the lodgings in the hospital were withdrawn from the chaplain, who thereafter lived in the town. 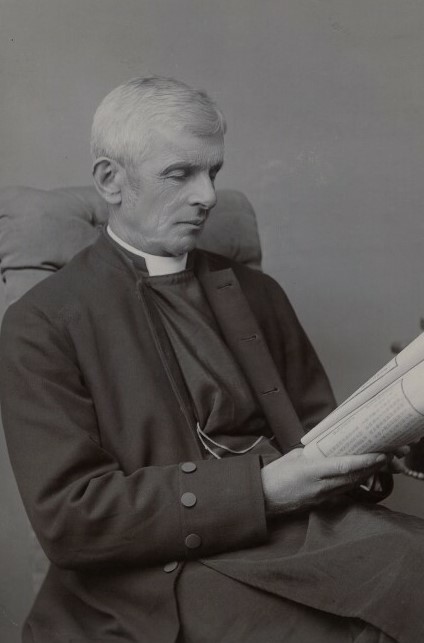 The most notable chaplain was George Evans Moule (1828-1912), who was the first to be independently appointed by the hospital’s management committee in 1855. He held the post until 1857, after which he travelled to China to undertake missionary work. He was made Bishop of Mid-China in 1880, resigning from the bishopric in 1906. The following list is incomplete, as work continues to identify the hospital’s chaplains. You can also read about the chapel at Dorset County Hospital. Image details: George Evans Moule by Walter Pouncy, albumen cabinet card, circa 1890s, 5 5/8 in. x 4 in. (144 mm x 103 mm) image size, given by Corporation of Church House, 1949, Photographs Collection NPG x159319.